Hazmat • Woman in hospital; upstairs neighbors return after house is decontaminated. Leah Hogsten | The Salt Lake Tribune A suicidal woman and a family living in an upstairs apartment were rushed to a hospital overnight in North Logan after reportedly being exposed to potentially deadly ricin fumes. North Park Police officers cordoned off this home after a woman apparently tried to commit suicide with ricin. 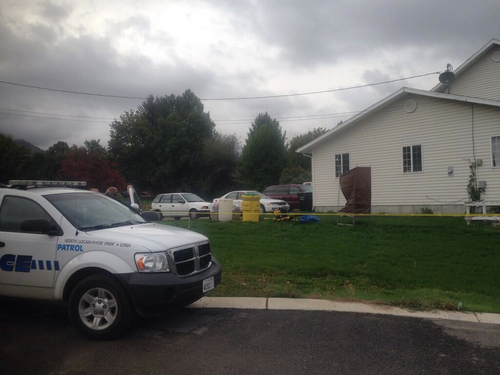 Courtesy KUTV Leah Hogsten | The Salt Lake Tribune North Park Police Chief Kim Hawkes said there was no indication that ricin fumes escaped the house itself or posed a danger to neighboring homes at a press conference Thursday, October 23, 2013. A suicidal woman and a family living in an upstairs apartment were rushed to a hospital overnight in North Logan after reportedly being exposed to potentially deadly ricin fumes. The incident began about 10:30 p.m. Wednesday when a 911 call came from the woman's cousin, claiming that the woman, who lived in a ground floor apartment at a home at 2270 N. 740 East, had attempted suicide. 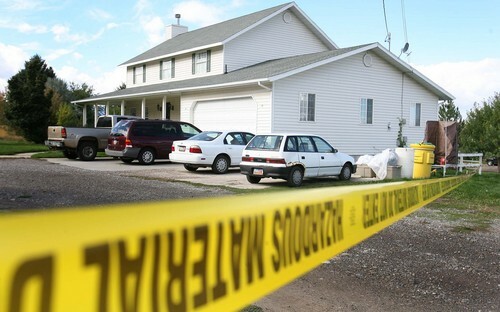 Leah Hogsten | The Salt Lake Tribune A suicidal woman and a family living in an upstairs apartment in this North Logan house were rushed to a hospital overnight after reportedly being exposed to potentially deadly ricin fumes. Leah Hogsten | The Salt Lake Tribune "I feel bad for her," said Nancy Jensen about the woman who lived two houses down from her who tried to commit suicide Thursday, October 23, 2013. A suicidal woman and a family living in an upstairs apartment were rushed to a hospital overnight in North Logan after reportedly being exposed to potentially deadly ricin fumes. The incident began about 10:30 p.m. Wednesday when a 911 call came from the woman's cousin, claiming that the woman, who lived in a ground floor apartment at a home at 2270 N. 740 East, had attempted suicide. 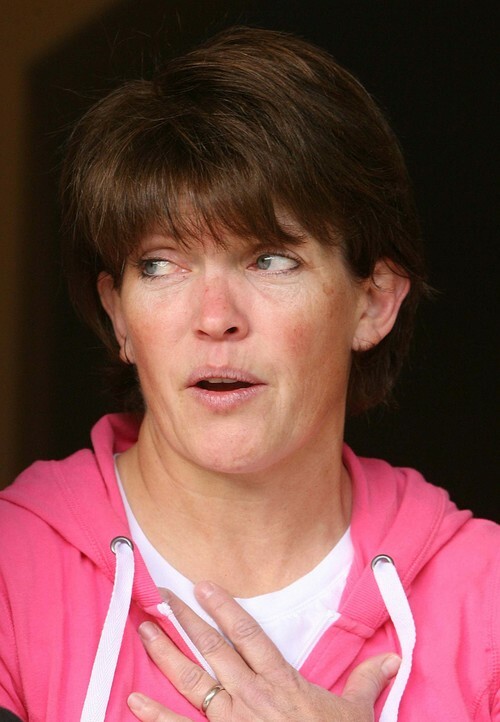 Leah Hogsten | The Salt Lake Tribune One of two members of National Guardís 85th Civil Support Team that took ricin samples from a suicidal woman's apartment in North Logan after she reportedly tried to kill herself by ingesting ricin. The incident began about 10:30 p.m. Wednesday when a 911 call came from the woman's cousin, claiming that the woman, who lived in a ground floor apartment at a home at 2270 N. 740 East, above, Thursday, October 23, 2013, had attempted suicide. Leah Hogsten | The Salt Lake Tribune "I feel bad for her," said Nancy Jensen about the woman who lived two houses down from her who tried to commit suicide Thursday, October 23, 2013. A suicidal woman and a family living in an upstairs apartment were rushed to a hospital overnight in North Logan after reportedly being exposed to potentially deadly ricin fumes. The incident began about 10:30 p.m. Wednesday when a 911 call came from the woman's cousin, claiming that the woman, who lived in a ground floor apartment at a home at 2270 N. 740 East, had attempted suicide. North Logan • The upstairs neighbors of a 37-year-old woman who apparently tried to commit suicide with ricin were able to return home Thursday evening after a hazmat team determined there was little danger of exposure. "The incident poses no danger to the neighboring houses," Jason Killinen, a spokesman for the North Logan Fire Department said in a blog posting Thursday evening. The woman remained hospitalized but was talking with police and the FBI on Thursday. 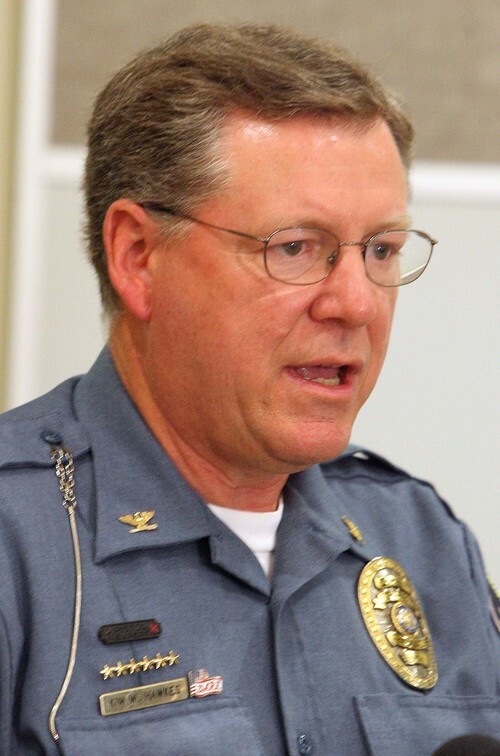 Production of ricin, which can be a weapon of mass destruction, violates federal law, but it was not clear whether prosecutors would prosecute her since her aim, according to North Park Police Chief Kim Hawkes, was to die  not to spread the deadly toxin. North Park is the police agency for North Logan and Hyde Park. 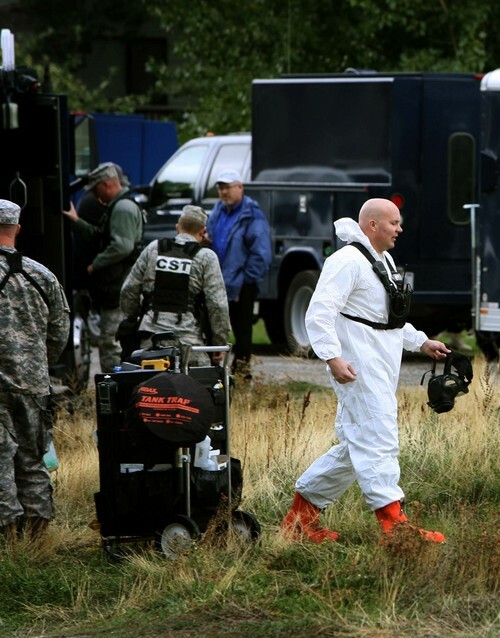 Members of the Utah Air and Army National Guard&apos;s 85th Civil Support Team entered the home  divided into a basement apartment where the woman lived and another above  in the late afternoon. No ricin was found in the upstairs apartment or in the ventilation system, clearing the way for the family of four  a couple, a grandmother and a son  to move back in. Ricin was found, however, in the basement apartment. The Bear River Health Department planned to work with the homeowner to mitigate any residual contamination, Killinen said. Ricin is highly toxic, and at high levels of exposure can cause severe diarrhea and fatal episodes of shock. Death typically occurs within three to five days of the initial exposure due to multiple organ failure. The scare began when the woman&apos;s out-of-state cousin contacted police Wednesday about 10:30 p.m. after exchanging texts and at least one phone call with the woman, Hawkes said. The North Logan woman was nauseated and vomiting during the day Wednesday and apparently told her cousin something that alarmed her. "She knew she was sick," Hawkes said. The woman ordered 60 castor beans online, soaked and apparently ground and ate half of them, he said. She made no attempt to broadcast the deadly toxin or to vaporize it, he said. 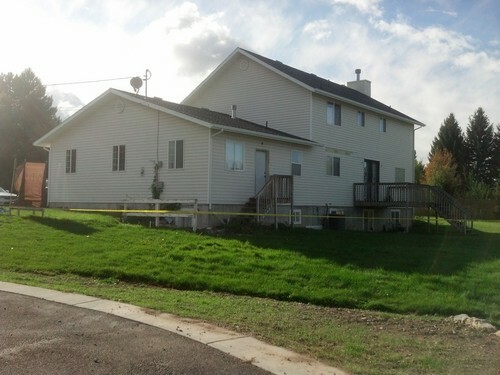 Killinen said the woman told police on Thursday that she learned to make ricin online. Neighbor Nancy Jensen said the upstairs neighbors were not happy to have to evacuate their home and to leave behind even their car keys. "It&apos;s disheartening to be taken out of your house in your pajamas," she said of the family. They were checked out at a hospital Wednesday night and stayed with friends while waiting to return home. The woman who ate the castor beans has back trouble and suffers mental health issues, Jensen said. Members in the North Logan 5th Ward of The Church of Jesus Christ of Latter-day Saints had tried to help, said Jensen, who has delivered meals but had little conversation with the woman. "There&apos;s nothing more we could have done to help her," she said. The National Guard&apos;s 85th Civil Support Team is one of 50-plus around the country that helps local agencies respond to hazardous material spills, accidents and other exposures. The team is based in Salt Lake City. Its members are full-time employees of the Guard and essentially active duty, so they are still working during the federal government shutdown, said Lt. Col. Hank McIntire, spokesman for the Guard.